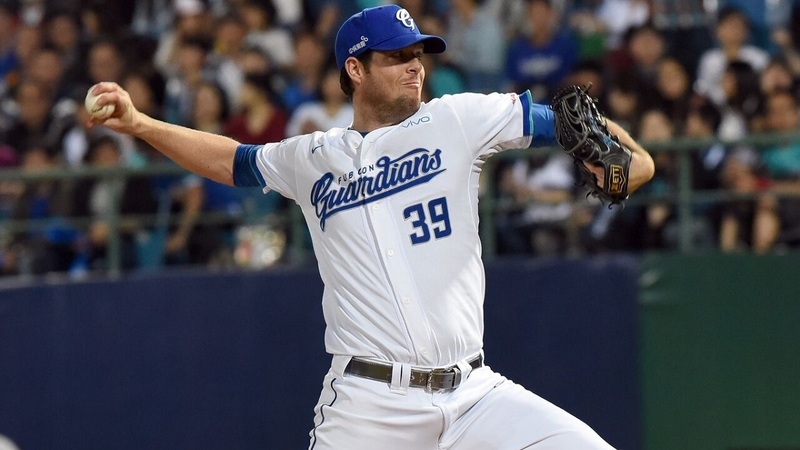 The Fubon Guardians’ Mike Loree have demonstrated to everyone why he is the best pitcher in the CPBL, as the winner of the 2016, 2017 Pitching Triple Crown have retired the first 21 Uni-Lions batters he faced last night. With great command along with his infamous forkball as the out pitch, Loree cruised through the first seven innings with only 67 pitches while struck out six in the process. 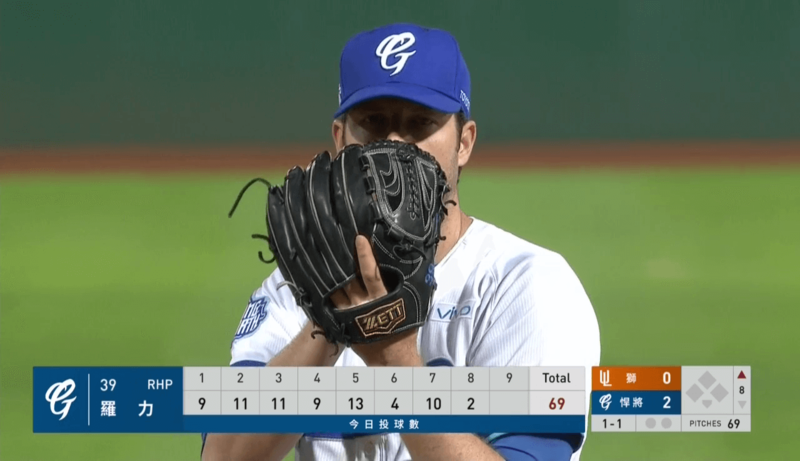 Loree’s perfect game was ended by the Uni-Lions 鄧志偉 (Teng Chih-Wei) in the eighth inning, as he hit one past the Guardians infield defense on a 2-2 count. After the Teng’s single, Loree gave up another two more hits to the Uni-Lions and loaded up the bases. However he was able to settled down and escaped the bases-loaded jam by striking out 黃恩賜 (Huang En-Tzu). Loree finished the night with eight scoreless innings (seven of those were perfect), while gave up three hits in the eighth and two hits in the ninth. “The last time I came close to a no-hitter was back in 2008 playing in the San Francisco Giants system, and I hope I don’t have to wait another ten years for the next time,” said the Guardians ace Mike Loree. Mike Loree is one of the reasons for my recent interest (last five years) in the CPBL. The San Francisco Giants drafted him in the 50th round of the MLB amateur Draft (back when the MLB draft still went 50 rounds) out of Villanova, which is playing tonight for the college basketball championship. He was seen and treated as roster filler because he doesn’t throw real hard, but had a great year in the Atlantic League in 2011, went to Taiwan, and the rest is history. His forkball and his fastball command, which sets up the forkball, are just tremendous. No matter how many times CPBL hitters see his stuff, and they see it a lot, they still have trouble picking up which of the two pitches is coming out of his hand. I hope he sticks around in CPBL long enough to set the foreign pitcher records (career wins, stike outs) held by Ozzy Martinez. Loree needs 15 wins and 140 Ks in 2018 to pass Jonathan Hurst for second all-time in these categories. He could well do it, if this year’s overall performance is similar to his recent seasons. Loree is definitely one of the rare gem in the CPBL. After so many years, the batters still can’t figure him out, especially his forkball, like you said. Everybody know it’s coming, but they still unable to hit it. I think he mentioned several times in the past that he enjoys playing in Taiwan and would love to play here until retirement. Is Fubon Guardians’ attendance better when Loree is starting? It seems like it should be, since he is the league’s top starter. In Taiwan, generally speaking whoever is starting doesn’t really correlate with the attendance. However there are several previous cases that I can think of. Basically whenever he starts, it’s always a packed house. The Elephants saw that opportunity and always let him start on the weekend. Former MLBer Tsao Chin-Hui (Signed by Rockies for 2.2M USD) had a similar star power during his time in the CPBL. Whenever he start, it’s a packed house. However, he was involved in the game-fixing scandal in 2009 and received a permanent ban. Haha, probably no need to introduce him. But EDA Rhinos was killing it with their attendance when Manny was here. Who else I think can have this star power to drive the CPBL attendance? That person is former Yankees’ Wang Chien-Ming. CPBL English recently published a piece on CPBL salaries for domestic stars. If their numbers are correct, it seems entirely possible that before the 2018 season Loree could have signed a two-year contract that will pay him $600,000 total, given Loree’s veteran status and past CPBL success. Not too shabby for a guy who never got a fair shake from the MLB-system. I’m interested to see if Orlando Roman will try to pitch in the Atlantic League this year in the hopes that he might return to the CPBL later in the year. With Loree signed for two years with the Guardians. Maybe instead of 10 months pay, he will receive the full 12 months just like all the Taiwanese players? If that’s the case, maybe the salary is even higher? As for your question about Wang Po-Jung salary vs his service years. Signed in late August 2015 for $165,000 USD + $34,000 incentive bonus. If Wang Po-Jung did not go play in the oversea market. I’m suspecting the Monkeys will adjust his contract early and bump it higher. As Monkeys have the tendency of lock in their star players with multi-year contract. Being the poorest team in the league, that’s one of their strategy. Here’s what I think will happen if Wang did not go overseas. Or if Monkeys really want to generate some buzz and for good PR points. Jump straight to that magic $480,000 bracket. But I guess it all depend on Wang’s movement next year. Loree pitched another good one. He’s got 24 Ks and only one walk allowed after his first three starts. Expecting another year of solid performance from Loree.